I don’t consider myself much of a competitive beer brewer, so I primarily brew what I enjoy brewing. So today I thought I would share a few of my favorite beer styles and provide links to a few recipes you also might enjoy. These are all ales you can brew yourself easily at home without any special equipment. Heading the list is a good English Porter. As you will see I enjoy dark beers, and Porter is perhaps my favorite overall style. Porter itself has an interesting history. It was one of the first mass produced beers, reaching incredible levels of popularity in the late 1700’s. It was once brewed in vessels as large as 20,000 barrels, a volume that dwarfs the largest modern breweries (about 1600 barrels). The English style of Porter is my favorite due to its inherent complexity. Not only are a variety of dark malts often used, but the English ale yeasts and hops provide another level of character to the beer leaving a cacophony of flavors. Early in my brewing career I would often make “kitchen sink” porter which consisted of whatever dark malts I had laying around. Here’s one of my early porter recipes that came out well, and I’ve brewed many times. Looking at it now, I would probably cut down on the caramel malt a bit (caramel is overused by many brewers these days) but the recipe still stands up well. Belgian wit is one of my favorite lighter colored beers. The all grain version is easy to make, and the combination of unmalted wheat and a hint of spices gives it a wealth of body and aroma. It is also a very popular beer with guests, which is an important thing if you are a dark beer drinker like I am. The characteristic flavors of Wit (white beer) come from the use of unmalted wheat (50% in this case). I prefer to use flaked wheat as it can be mashed right in with the pale malt, and does not require a separate cereal mash. Clarity is generally not a concern with this beer – it will likely be cloudy but most guests don’t care because it tastes great. A touch of cracked coriander seeds and bitter orange peel provides just the right amount of spice aroma in the finished beer, making it unique. Here’s the recipe for my favorite Belgian Wit – an exceptionally easy beer to brew that comes out great every time. I love stouts, including sweet stouts, milk stouts and imperial stouts. Arguably the easiest of my favorite stouts to make is the Dry Irish Stout. It has a strong, distinctive coffee-like flavor, amazing body and head, and looks to the uninitiated as if I am drinking 30-weight motor oil. What could be better? To brew the perfect Irish Stout you actually need to defy some common misconceptions. First, even though the beer is loaded with body, it is not a high gravity beer. In fact the Irish version clocks in at around 1.036. Secondly you do need enough hops to properly balance the beer – so you can’t under-hop it. Next you need body, and lots of it – which again comes from unmalted grain – in this case a generous dose of unmalted (flaked) barley. Finally you need to get the dry coffee flavor – which only comes from Black Barley (Stout Roast). Unlike black patent malt which is roasted malt, black barley (stout roast) is made from darkly roasted unmalted barley. 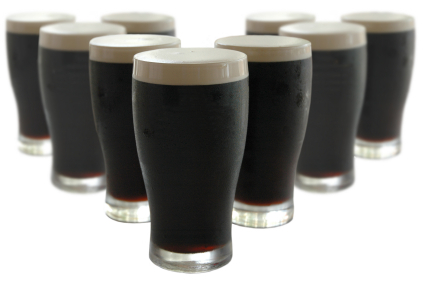 So here’s my favorite Dry Irish Stout recipe – another easy to brew beer that comes out great every time! So that is a summary of three of my favorite beers to brew and keep on stock. If you have a beer style or recipe you enjoy, share it on BeerSmithRecipes.com and leave a note below! Dry Irish Stout is my favorite.